Smoke Wash is a cleaner and deodorant effective on all types of fiber materials, including upholstery, clothing, linens, blankets, draperies, and more. Use as laundry cleaning booster to deodorize soot and smoke odors in washable fabrics – simply add to each laundry load. 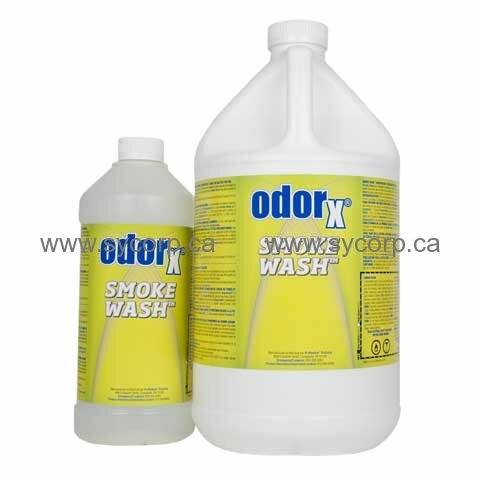 Smoke Wash can also be used for "dry foam" cleaning upholstery or carpet. Water-soluble Smoke Wash can be added as a booster to wet side of carpet and upholstery cleaning solutions. Mixing: Add 2 oz. to each wash load. For dry foam cleaning add 1 to 3 ounces per gallon and agitate into a foam. Application: Add to water soluble cleaning solutions.